In the last 25 years, along with the opening up of the economy and growth of the industry, there has been an exponential growth of both private and public business schools. Public business schools have also started expanding giving a tough competition to private business schools. There is competition in both the supply (B-schools) and demand side (MBA aspirants) to match the aspirants' needs and get them a rational return on their investment (RoI) through this tool called management degree. To understand the strategy of MBA admission in business schools, it is pertinent to understand the networks of MBA colleges and the created networks of aspirants. This chapter is an attempt to understand the admission strategy of classified business management institutions in the socio-structural context of aspirants. For the classification of management institutions, the author has considered NHRDN ranking of 2018. 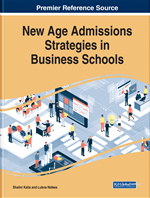 The chapter also explores the MBA admission strategies of these top business schools in the context of their institutional branding and student networks effects. Tracing back, it is indubitable that management education has been ingrained in our civilization since time immemorial. From the mythological literature like Bhagwad Geeta in which the teachings essentially envelopes lucid description of managerial techniques to let us rise above any sorts of conflicts, to the existing remains of Mohanjodaro and Harrapa civilizations, it is evident that our lifestyle had always sorted itself in terms of management and administration. Coming to the history of the formal management education in the country, procrastinating the demand and need for grooming the Indians on management front, India was house to nine management education institute by 1958. The Indian Institute(s) of Management (IIMs) was established in the early 60 decades in Calcutta (Now, Kolkata) and Ahmedabad, respectively. With the then Department of Commerce in universities revisiting their curriculum to accommodate management education, it is interesting to note that by 1990, India had around eighty-two university-based management departments and the list also included some prominent names like the University of Delhi and Punjab, which established separate Faculty of Management (Sinha, 2004).